Last year’s avalanche of directory-switching tools is still reverberating in my ears. I would never assume I found them all, but I am pleased that I’ve found so many. Here’s go2, which is another of the same vein. Append go2 with a string and it will try to find a directory in your tree that matches it. Give it the -r flag and it will search through all your root directory, which makes it quick and easy to jump across wide chasms in your system. The first time you run go2, it will fit itself into your .bashrc, and from then on you can access its finer features without any hassle. Aside from that, I saw very little configuration that go2 needed. If go2 runs into a situation where there is more than one option, it will prompt you for a choice. If your target is too fuzzy, that can take a little while. 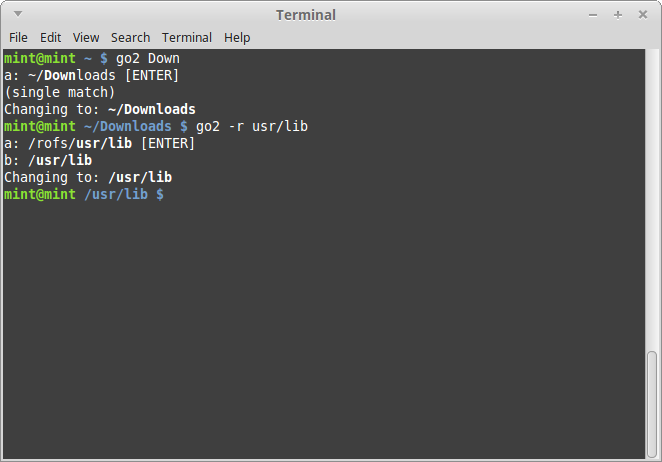 go2 is in Debian, but I didn’t see it in Arch or AUR. go2 has a few other options that you might not see in other fast directory-switchers, but I will leave them to you to discover. To be painfully honest, cd and tab completion are usually enough for me. If you need a little more oomph at the prompt though, this might be helpful. This entry was posted in Linux and tagged directory, fast, finder, shell, switch on 2015/02/10 by K.Mandla.